When 17-year-old Levi Katznelson’s brother, Boaz, returns from his stint as a marine in an unnamed Middle Eastern country, he’s a changed man. 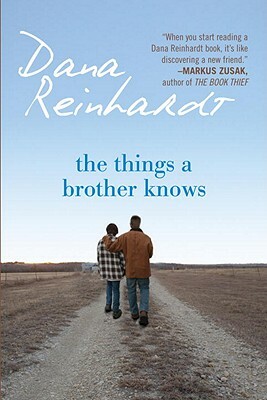 This relationship between the brothers is what propels The Things a Brother Knows by Dana Reinhardt along. When Levi was a kid, he adored Boaz. I used to worship him too. All little brothers worship their big brothers, I guess. It sort of goes with the job description. Think about it. Your brother’s face is one of the first you ever see. His hands are among the first to ever touch you. You crawl only to catch him. You want nothing but to walk like he does, talk like he does, draw a picture throw a ball, tell a joke like he does, let loose one of those crazy whistles with four fingers jammed in your mouth or burp the ABCs just like he does. To your mind, he’s got the whole of the world all figured out. Levi didn’t really understand why Boaz, a popular high school athlete went off to war anyway. So his homecoming is a complicated thing. The Boaz who returns to Levi and his parents is withdrawn, rarely speaks and won’t get in a car. He spends hours and hours in his bedroom studying maps and doing stuff on the computer. It frustrates Levi because he doesn’t understand and Bo doesn’t seem willing to explain. Then Boaz announces that he’s going to walk the Appalachian Trail. Levi is suspicious and does a little snooping and discovers a map that reveals a different route altogether. That’s when he makes the decision to abandon his summer job and go after Boaz. Although Levi’s figurative journey is quite a bit different from his brother’s, that summer is pivotal on his journey to adulthood. And while it’s true that The Things a Brother Knows is a “road-trip” book of sorts, the real story here is one of understanding. Understanding each other, sure, but also understanding ourselves. What do we believe in? What matters to us? I think Reinhardt manages this without coming off too preachy. Levi is a great character and so is his best friend, Pearl. an out-spoken Chinese girl Levi met in Hebrew school. Levi’s grandfather, Dov, is also memorable. Spending time with these characters is no hardship. At the end of the day, though, The Things a Brother Knows was just okay for me. The writing is fine. (There’s some swearing, for those concerned with that in a YA book.) The story moves a long, but I just felt it was sort of superficial and that, ultimately, the bow was tied a little too neatly. Still, it’s a book worth having in my classroom library. This entry was posted in Uncategorized and tagged 2013, classroom library, mature teen, YA by Christie. Bookmark the permalink.